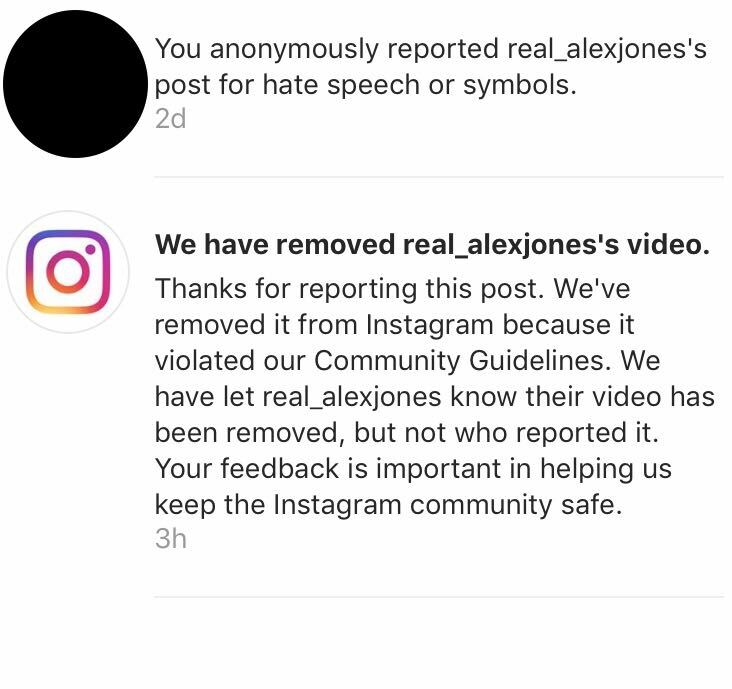 Update (3/22/19): Six posts and one IGTV video featuring Proud Boys founder Gavin McInnes have been removed from the @real_alexjones account since this article was published. They appear to have been removed by Instagram for violating their community guidelines . 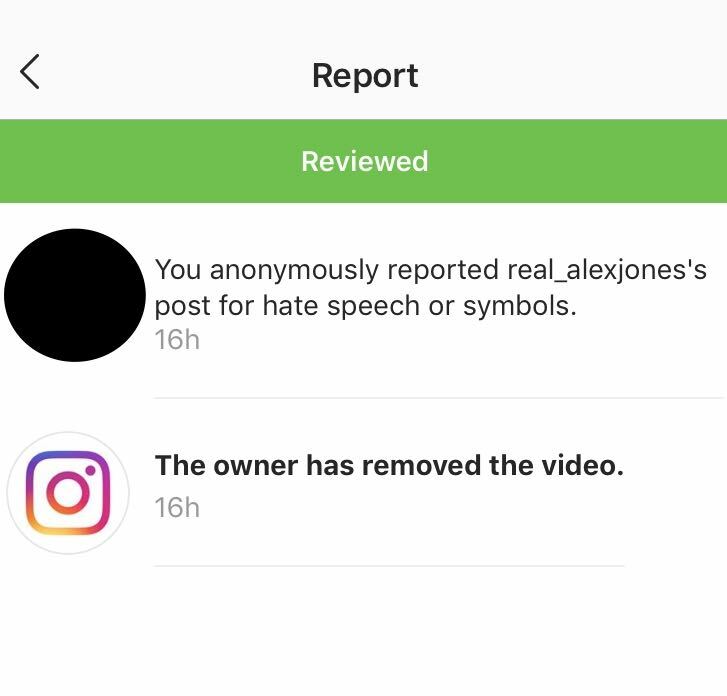 Update (3/20/19): Since the publication of this article, three  videos  containing  anti-LGBTQ speech and three  videos  containing  white nationalist content have been removed from the @real_alexjones account. 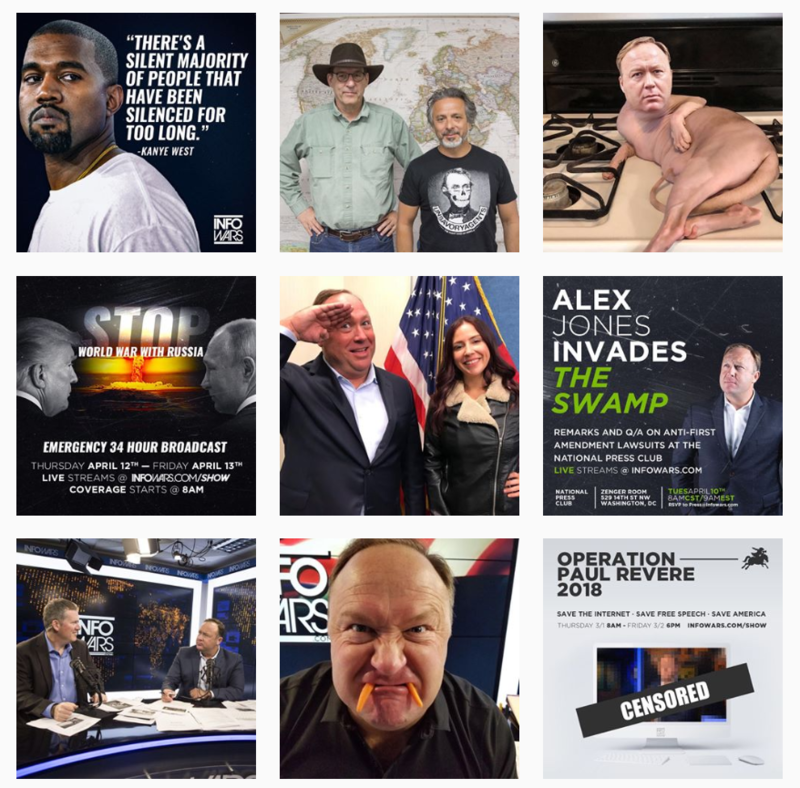 They appear to have been removed by Alex Jones , not Instagram. 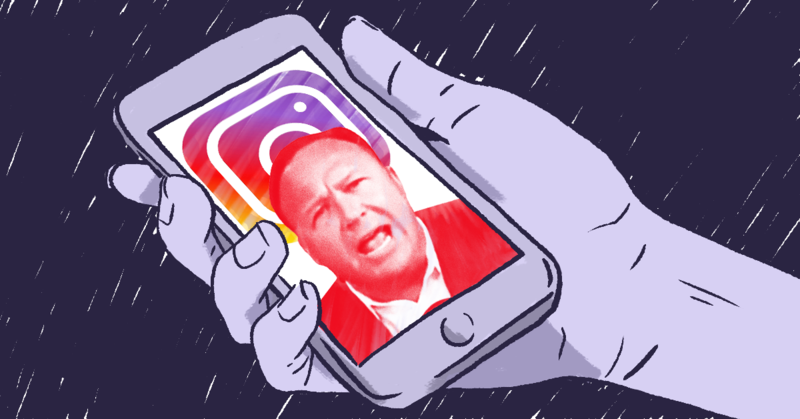 Conspiracy theorist Alex Jones has been using Instagram to regularly post Infowars videos that often include hate speech, conspiracy theories, and appearances from other extremist figures banned by the platform. 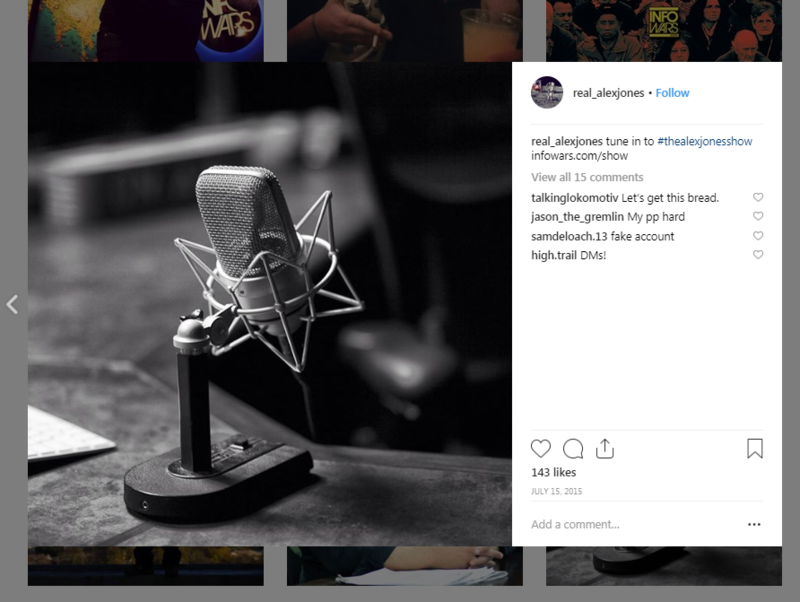 Instagram, which is owned by Facebook , is the only major social media platform that still permits Jones’ use after he and several other Infowars-affiliated accounts were banned from Facebook, YouTube, Apple, and Spotify  in August 2018. In the wake of those bans, Jones has made Instagram his new home on social media. 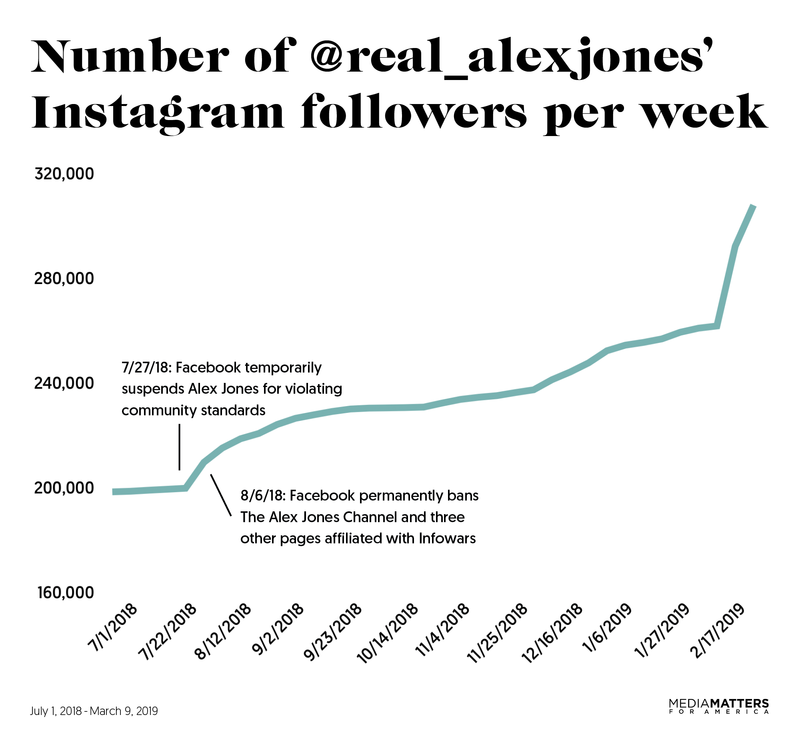 Jones’ Instagram account, @real_alexjones, gained over 100,000 followers in the months following his Facebook ban. 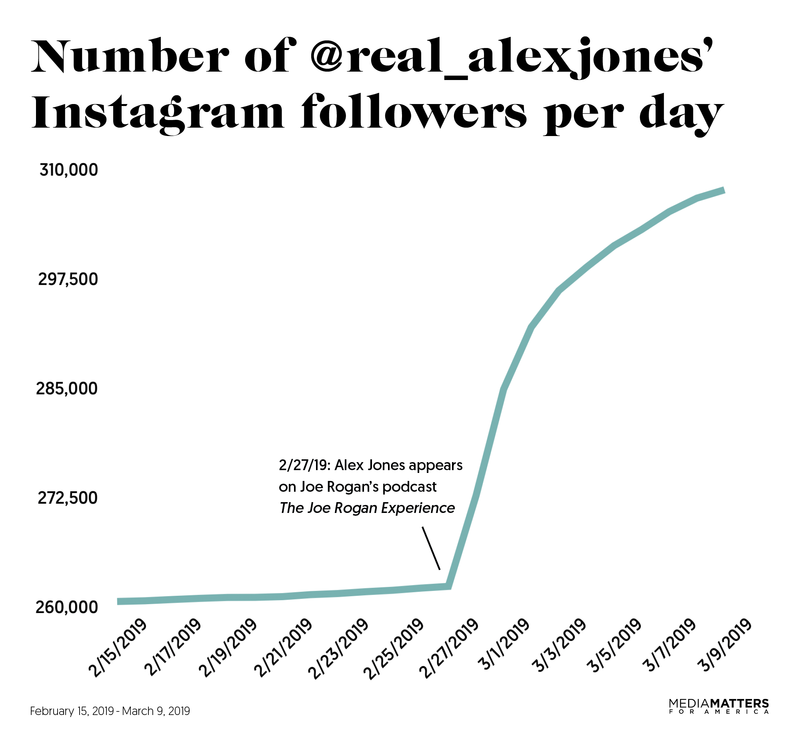 And since December, Jones has been posting short clips, longer IGTV  episodes, and live broadcasts of the widely banned conspiracy theory outlet Infowars. Most of the descriptions attached to these Instagram posts also contain links to Infowars’ site. Before the wave of tech platform bans, Jones’ Instagram account posted somewhat infrequently. The handle @real_alexjones had been active since 2015  and its content primarily  consisted  of memes and GIFs, often promoting conservatives, mocking liberals, announcing future guests on the show, and self-parodying Jones’ persona and show. 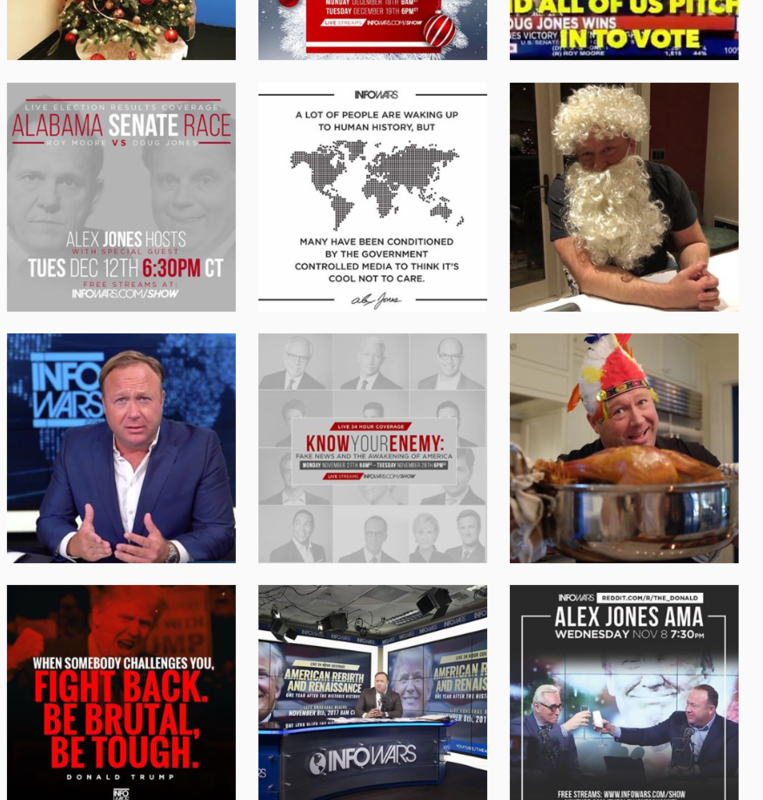 Jones’ Instagram content essentially served as a sanitized profile for promoting some of the more comedic and mainstream-conservative elements of Infowars’ show, and leaving out his far-right conspiracy theories and explicitly bigoted coverage. But a couple months after Infowars was banned from Facebook and other tech platforms, Jones started publishing Infowars clips and livestreams  and extreme, hateful content to Instagram. Since Jones began regularly posting content on December 13, his handle has earned over 5.7 million video views. On December 14, Jones posted an Infowars clip claiming that “globalists” (a term with anti-Semitic connotations ) in the U.N. are “flooding nations with millions of foreigners who have no intention to assimilate and who are not held accountable for their criminal actions.” This white supremacist talking point -- that migrant caravans are evidence of a Jewish plot to replace white people -- was embraced by the shooter  who went into a synagogue in Pittsburgh, PA, and killed 11 Jewish people last October. 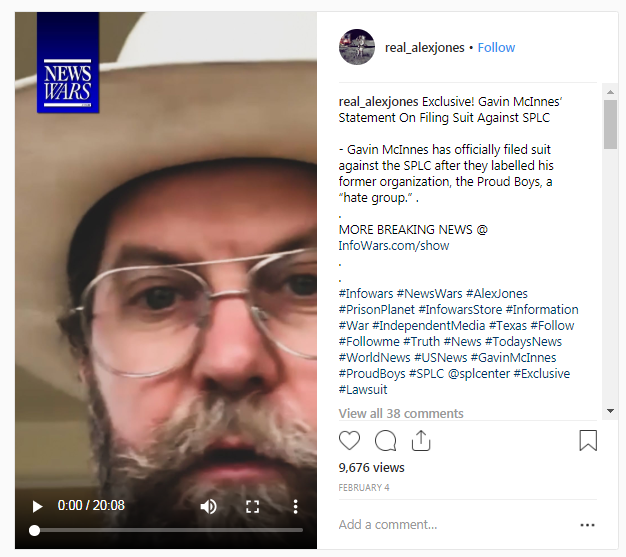 Gavin McInnes, founder of violent gang  the Proud Boys, has  appeared  in  at  least  eight  posts  from  Jones’ handle and one IGTV video  since McInnes was banned from Instagram in October, along with other accounts affiliated with the Proud Boys . Some of these videos posted by Jones have promoted the Proud Boys. One post  comedically assembled clips from an Infowars episode in which McInnes “initiated” Jones into the Proud Boys gang  by punching him repeatedly while Jones listed cereal names. In another post, which has been deleted or removed, McInnes defended Proud Boys members who were arrested after attacking a group of protesters while yelling anti-queer slurs . McInnes claimed the Proud Boys were “defending themselves” -- a claim that was debunked  by surveillance footage soon after McInnes’ appearance. Jones also posted  an Infowars clip featuring British anti-Muslim bigot Tommy Robinson on March 7 -- one week after Robinson was banned from the platform  for violating hate speech content policies. In this clip, Robinson claimed that far-left groups, media outlets, and “Muslim organizations” were all conspiring together to bring him down. On March 8, Jones shared video  of a congressional hearing in which Sen. Rand Paul (R-KY) expressed opposition to mandating flu vaccines. The post described the video as “Infections From Vaccines In 3 States While 30 States Push Mandatory Vaccines.” Jones posted the video one day after Facebook announced  it would ramp up efforts to reduce the spread of vaccine misinformation.